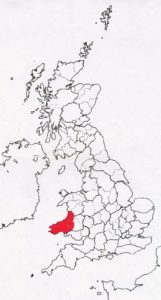 The historic shires of Pembroke, Cardigan and Carmarthen, that lie in the south west corner of Wales, make up this area. 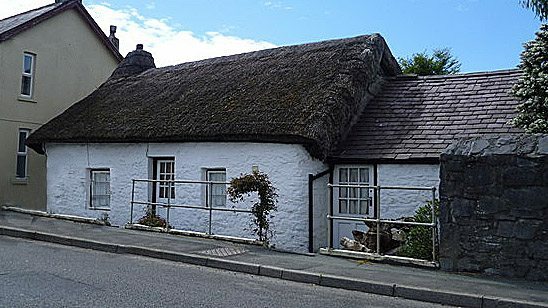 I have included this area within the Southern thatching tradition, but only just… The widespread use of the stobbing method, in these counties, almost tips the balance, towards inclusion into the Northern area. 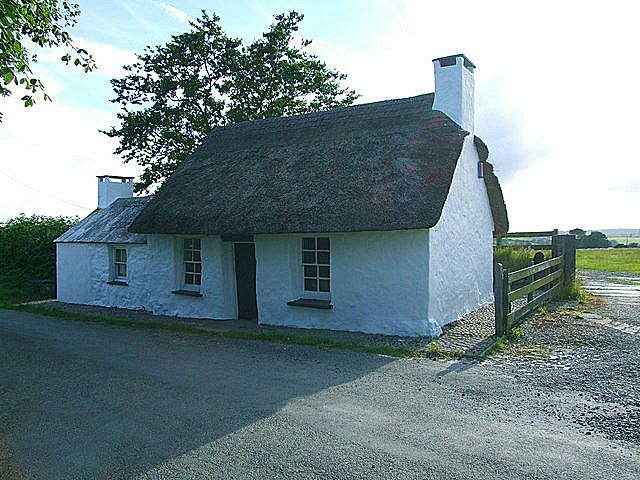 But this is outweighed, by the curved roof shapes mostly found here; and the almost exclusive use of straw, for ridging. 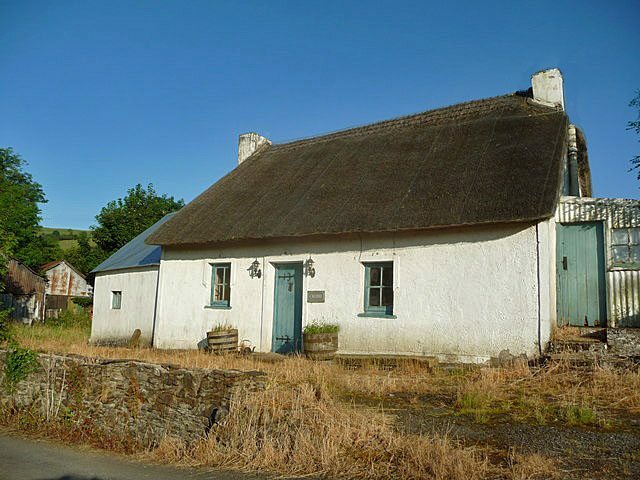 Historically, poor soil and a harsh climate, lead to material shortages, in this corner of Wales; which, along with its historic links to the craft in Ireland, perhaps helped give this area a distinct thatching style. 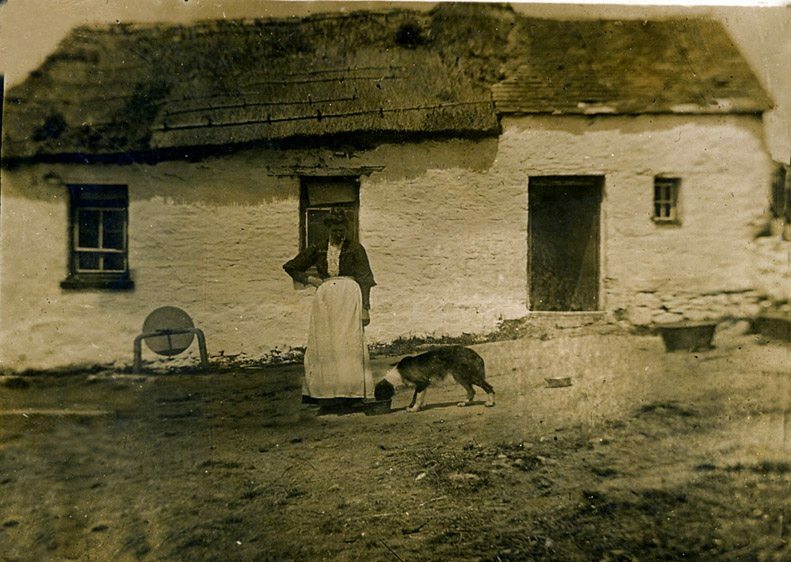 Only Just… This image shows a ‘Rush thatch at Pontrhydfendigaid’. 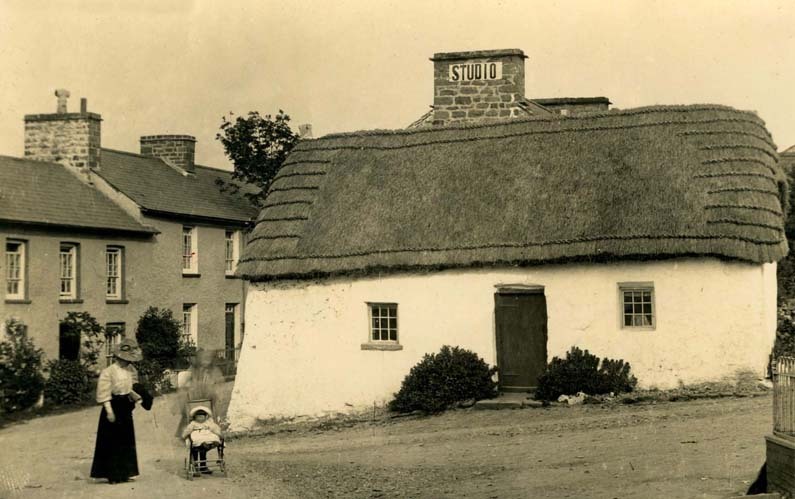 The use of rush instead of straw for thatching and the use of turf, with some crook and caber outside fixings; would not normally place this roof in the ‘Southern’ tradition, only it’s location does. 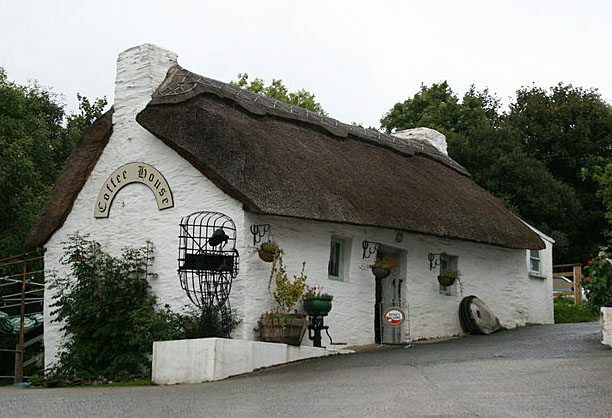 As mentioned, it is the climate and the avialability of materials, that are the main factors, in how a roof is thatched. 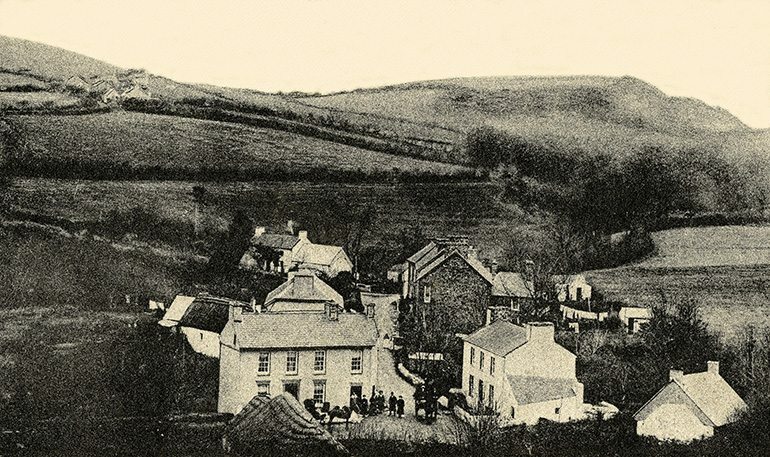 This Victorian scene, shows a Cardiganshire cottage, that lay in the shadow of Dibyn Du and Pen y Bwlch, two handy sized mountains; not the best land for cereal crops… Pontrhydfendigaid straddles the River Teifi, no doubt a good source for rushes. The lady on the left, seems to be wearing a medal, I wonder what it was for? Much use was made of straw rope, as a replacement for wood here. 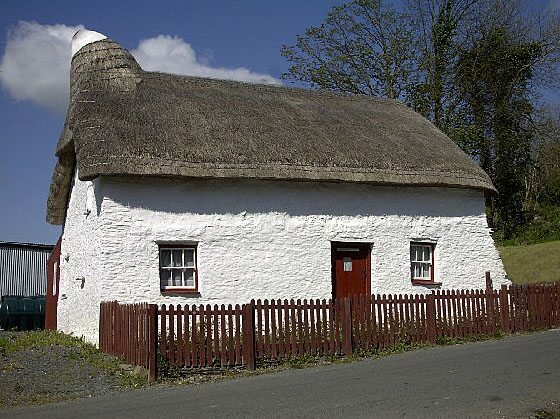 In Pembroke, it also replaced the small roof timbers, in a similar fashion, to some highland thatching methods. 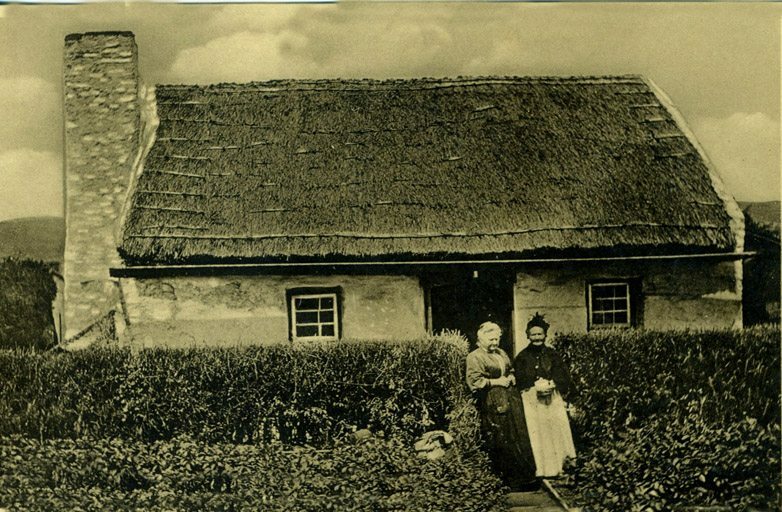 Straw ropes also replaced liggers, both on ridges and the edges of long straw roofs; as the old images show. This scarcity of material also becomes apparent, under the thatch coatwork. 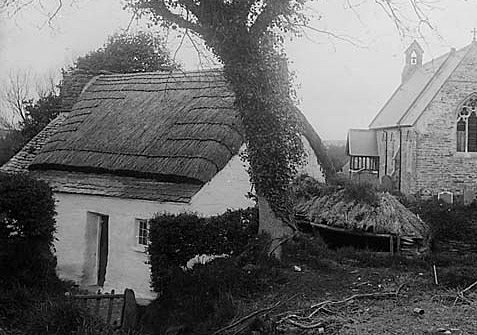 Here turf, small branches, gorse and bracken; were used as an underlay, thus saving any straw, for the top layer of thatch. 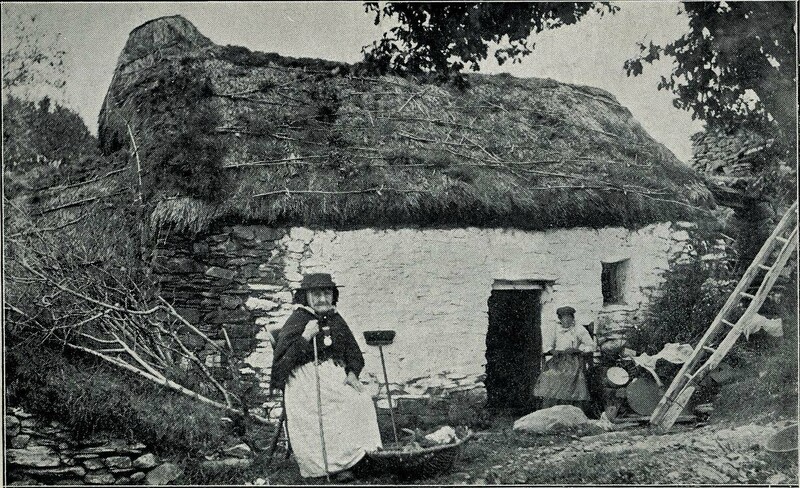 This area had much in common, with thatching in central and southern Ireland. 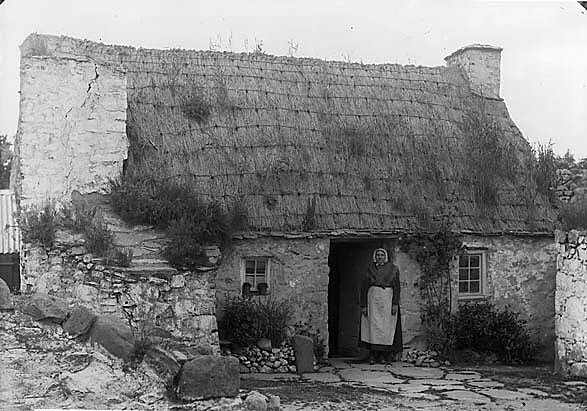 Using the same name for thatching spars; scallops; and the practice of employing straw rope, instead of liggers, on both eaves and ridges. 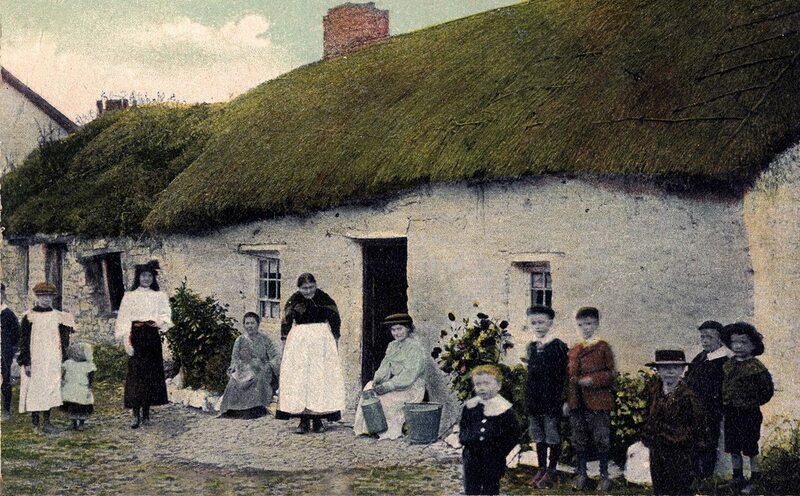 As seen above, in the photo of a County Waterford thatch. 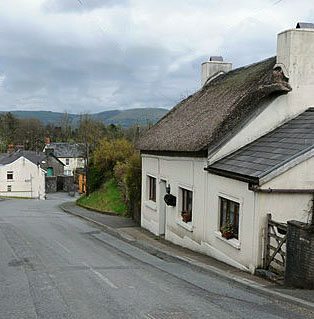 As with other parts of Wales, the rope top ridge is found here, again being identical to work seen in the very heart of Ireland. 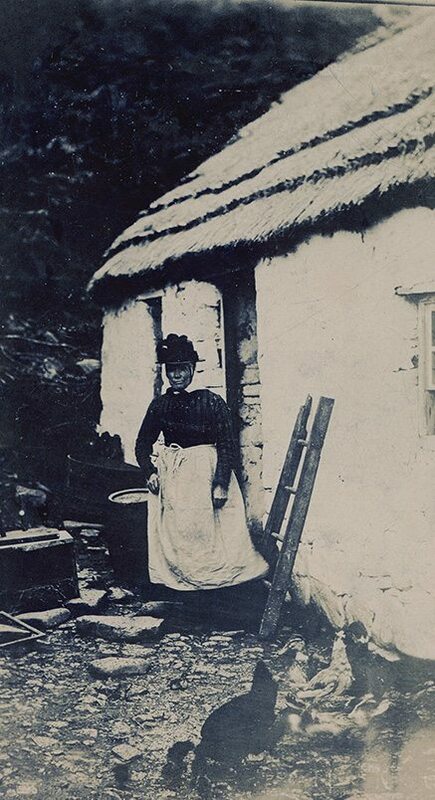 The stobbing method is old enough, for the language of Wales, to have named the tool, used in this method, A Tobren, literally, a ‘thatching stick‘. The method being used hereabouts. 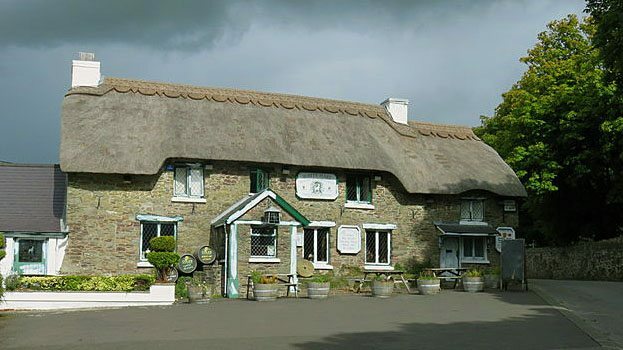 One is illustrated in the page on Non Standard Thatching. 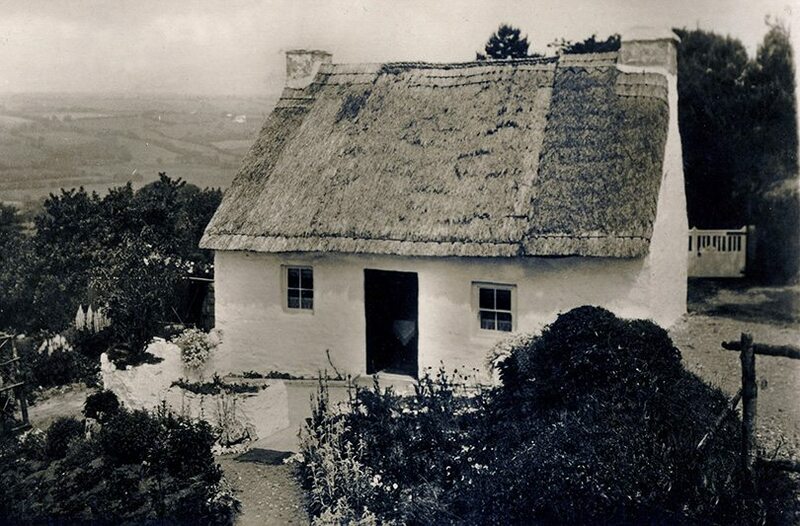 And so it came to pass… House thatching became a rare occurrence, for any thatchers, in these three south western counties. 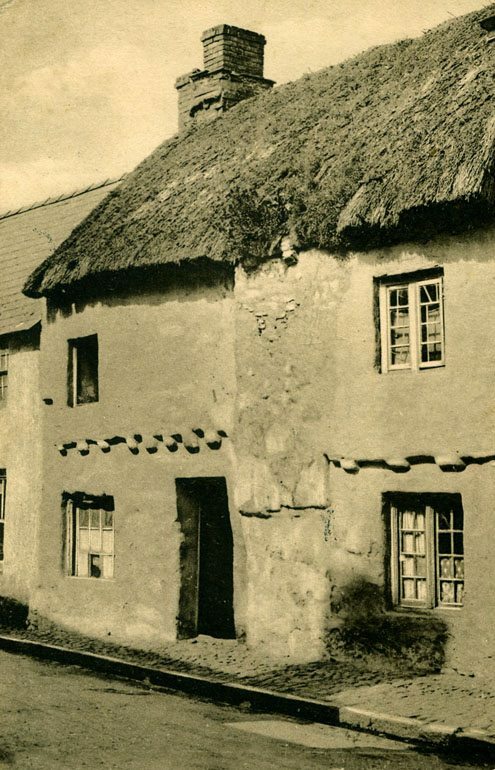 Kept busy instead, into the early 1960’s, thatching ricks and stacks, for the local farmers. 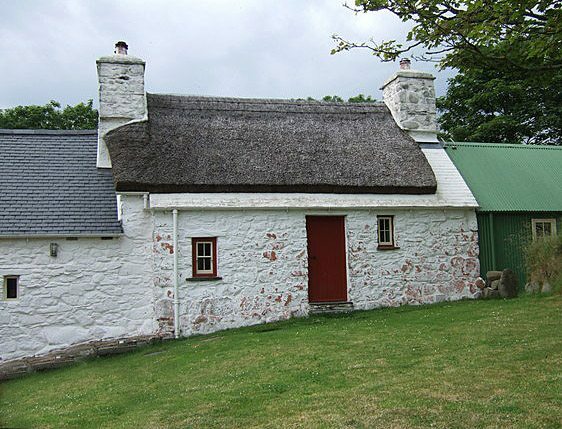 Thatch and slate… At Gilfachrheda. 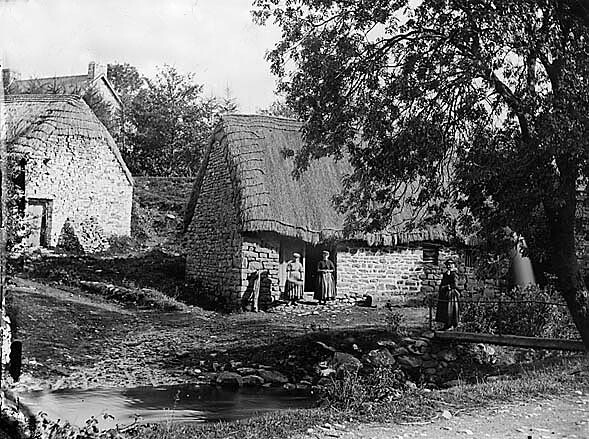 This old view, from around 1910, shows a thatched rick, in the foreground. Neatly fixed with straw ropes. But much of the village has roofs of slate, some very new. 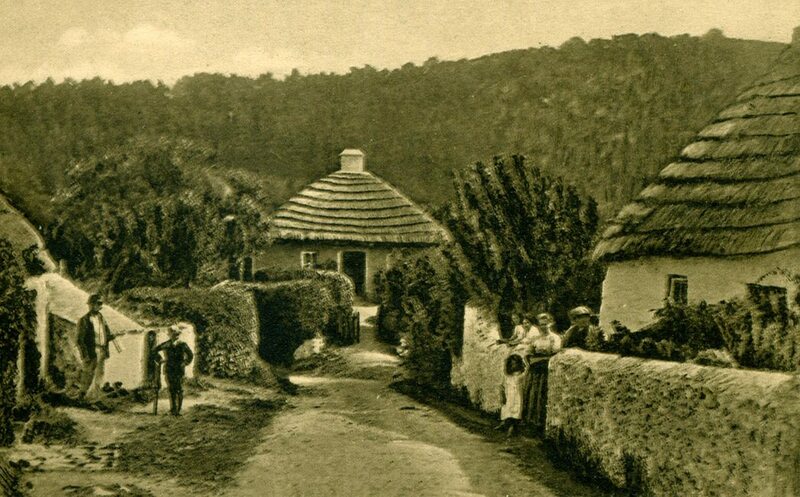 Like the cottage on the right. Where the end wall, still shows the old thatch roof line well. 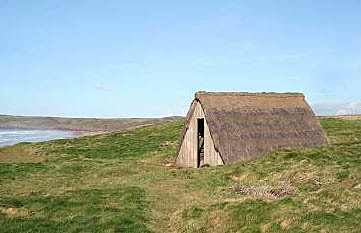 A small thatch is still to be found, tucked away behind the large building, behind the rick. 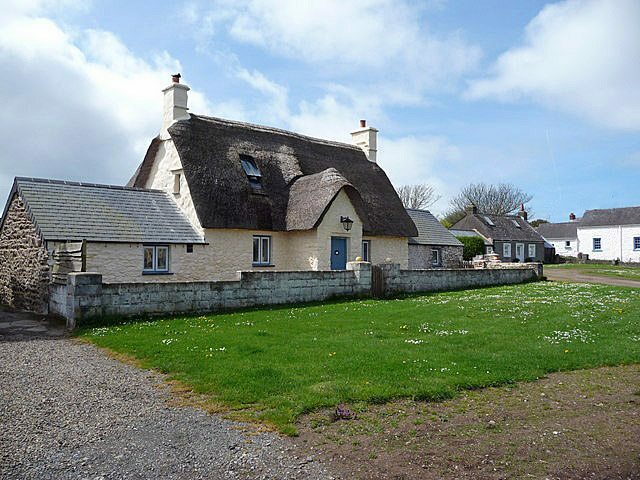 As expected, this thatch is finished with a rope top ridge, held with sparred straw rope. Changes… At Crwbin. 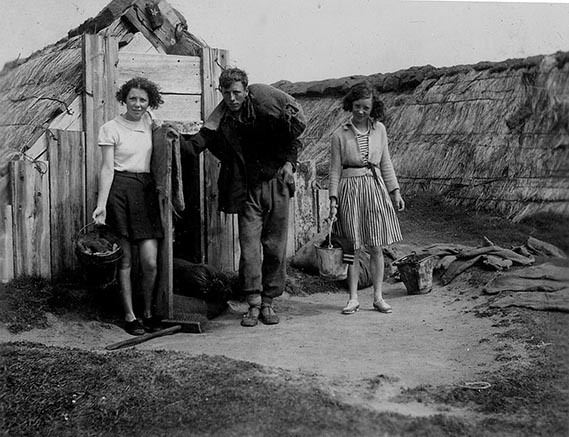 This photo, from around 1920, illustrates some differing fashions in the craft well. The centre, of this little roof, retains the local type of work. 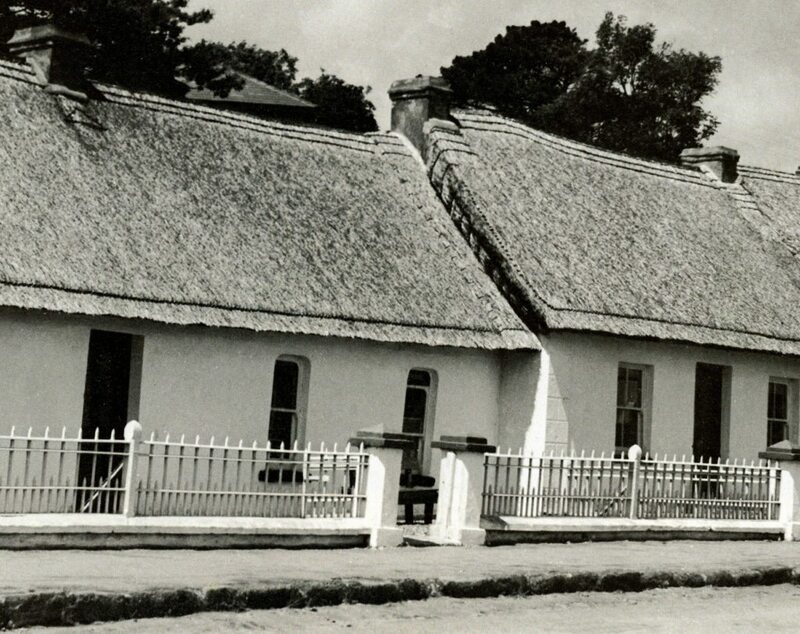 Long straw, topped with a rope top ridge. But the gable ends are newly done. Possibly in combed wheat reed, brought in from Glamorgan. 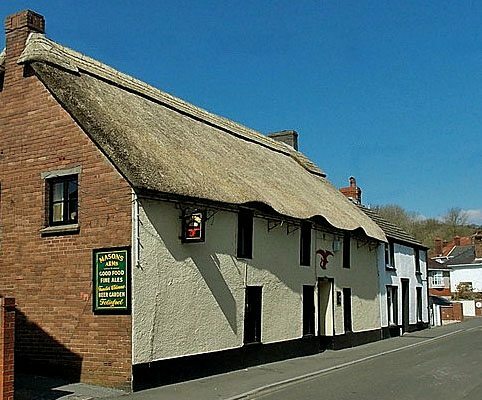 The thatcher has even finished with a fashionable ‘saw tooth’, ornamental ridge. Hoping no doubt to complete the centre section, at a later date. 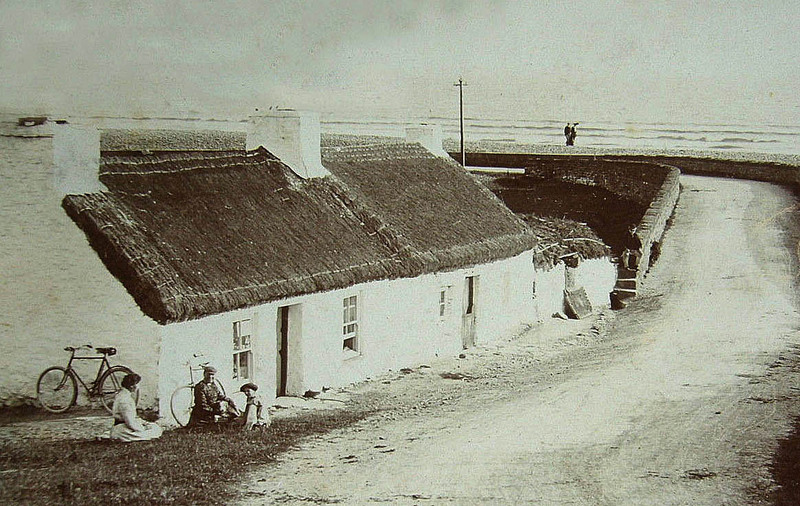 Camarthen cottages… left, at Pumsaint, in combed wheat reed. Photo; copyright and thanks, Jeremy Bolwell**. And above at Llansawel, in water reed. Photo; copyright and thanks, Phillip Halling**. 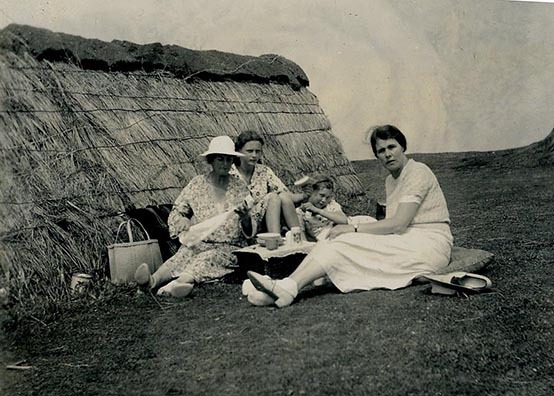 The post card and the two holiday snaps below it, seem to date from the late 1930’s. 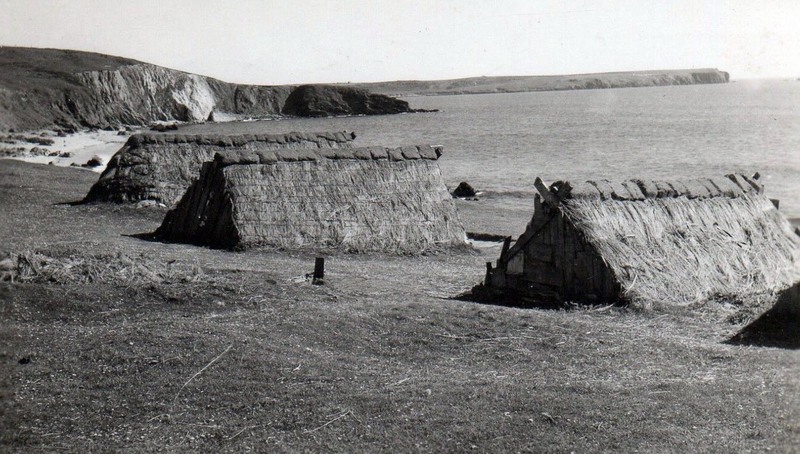 All show the sea weed drying huts, then found on the beach at Freshwater West; known today more for its surf, than any seaweed… The bottom right snap is entitled ‘Seaweed gathers at Freshwater West’.